With only a few months left before the deadline to reauthorize Section 702 of the FISA Amendments Act, the battle lines are starting to shape up. FISA provides the legal basis for warrantless surveillance, and when it was originally passed over strenuous objections from civil libertarians in 2008, it included a “sunset clause”. After being extended once in the lame-duck session in late 2012, Section 702 will sunset if it’s not reauthorized again by the end of the year. The “USA LIBERTY” act, from the House Judiciary Committee, fails to fix the real problems – and introduces new issues. Center for Media Justice has a solid critique; Marcy Wheeler has details on the inadequate “about” fix, the narrowly-scoped and meaningless attempt to close the backdoor search loophole, and bogus transparency provisions. Attorney General Jeff Sessions and Director of National Intelligence Dan Coats are urging Congress to reauthorize without making any changes – and remove the sunset clause to make it permanent. Sigh. EFF’s Pull the Plug on Internet Spying Programs offers an easy way to contact your Congresspeople. And, if you’re calling for some other reason, take a few minutes to ask them to oppose USA LIBERTY, reauthorization without change, and making 702 permanent. But, it’s far from over. Encouragingly, Ron Wyden and Rand Paul are planning to introduce an amendment to require a warrant for searches of incidentally collected information – a reform supported by a broad alliance of human rights and civil liberties organizations. * And especially if that amendment isn’t adopted, it’s possible that either the House or the Senate won’t pass an extension – which would be a very good thing for civil liberties. The battle over Patriot Act reauthorization in 2015 showed that the alliance of progressives, libertarians, and Tea Partiers is strong enough to have an impact if they stick to their guns. Lawfare‘s detailed analysis of support for Section 702 in the Senate suggests that in addition to Rand Paul, up to a dozen Republican Senators might not support reauthorization without reforms. Then again, there are quite a few Democratic Senators who routinely support mass surveillance. When the bills start to move forward and activists crank up “call your representatives!” campaigns, it might well be the first time Indivisible and the Tea Party find themselves on the same side of an issue — working with the Center for Media Justice, Cato Institute, the American Library Association, and other strange bedfellows. For the first time in years, the political winds may actually be aligning for surveillance reform. And there’s certainly a lot of grassroots energy out there. Since then, grassroots activism has really showed its strength on other issues – most notably the health care battle. Indivisible, with its emphasis on creative protests and in-person meetings with staffers as well as phone campaigns, is particularly well-positioned to pressure wimpy Democrats to hold the line on civil liberties – and to build on its successes pressuring potentially-wavering Republicans. Center for Media Justice and Color for Change have built deep connections with the civil liberties community. 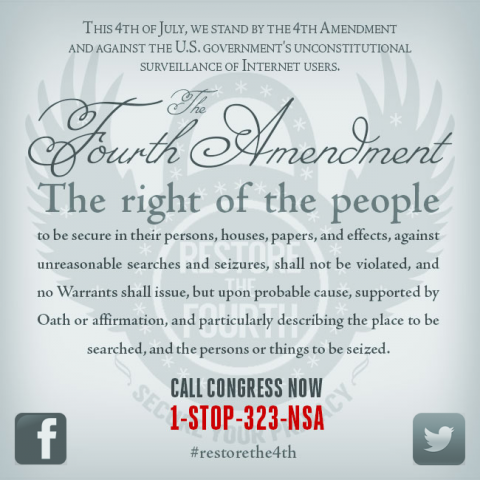 Longtime stalwarts like EFF, ACLU, Defending Rights & Dissent, and the ALA – and grassroots civil liberties groups like Restore the Fourth and Get FISA Right – continue to fight as well. Will it be enough? Stay tuned – and get involved! * Including EFF, Center for Media Justice, Color of Change, the Arab-American Anti-Discrimination Committee, the ACLU, the American Library Association, Restore the Fourth, Defending Rights and Dissent, EPIC, CDT, the National Center for Transgender Equality, the NAACP, the National Immigration Law Center, and Demand Progress. Broad-based indeed! This entry was posted on Sunday, October 8th, 2017 at 12:30 pm and is filed under news. You can follow any responses to this entry through the RSS 2.0 feed. You can leave a response, or trackback from your own site.